We explore how the mobile enterprise value chain has changed as technology continues to evolve. ABSTRACT: The penetration of wireless and mobile devices in addition to workflow convergence with mobility has unlocked the concept of “The Mobile Enterprise.” We analyze the value chain that has formed to serve the mobile enterprise. Frequently, mobile device proliferation is associated with media, entertainment, and personal consumption – however, mobility represents a paradigm shift for the modern enterprise, enabling incremental capabilities, advanced productivity methods and efficiency gains, altered organizational dynamics, and new digital channels to market. 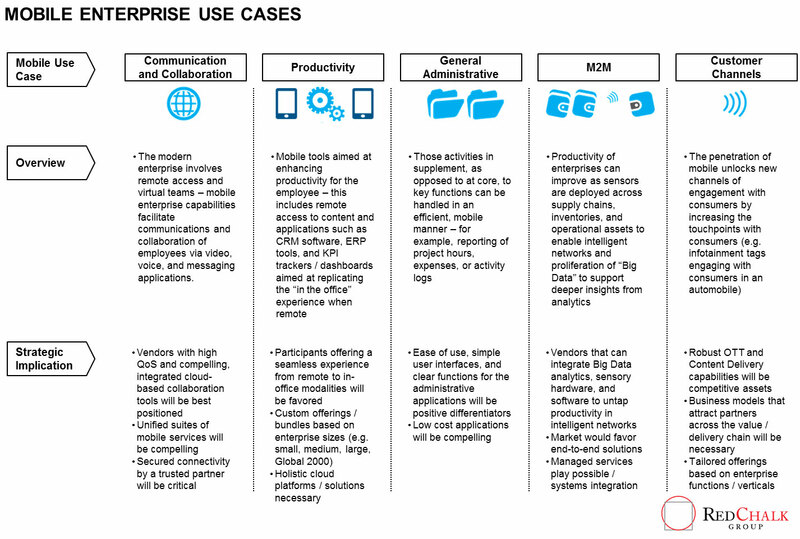 More specifically, the penetration and convergence of mobile form factors (e.g., smartphones), enterprise IT applications, and cloud infrastructure have collectively catalyzed a move towards holistic enterprise mobility. 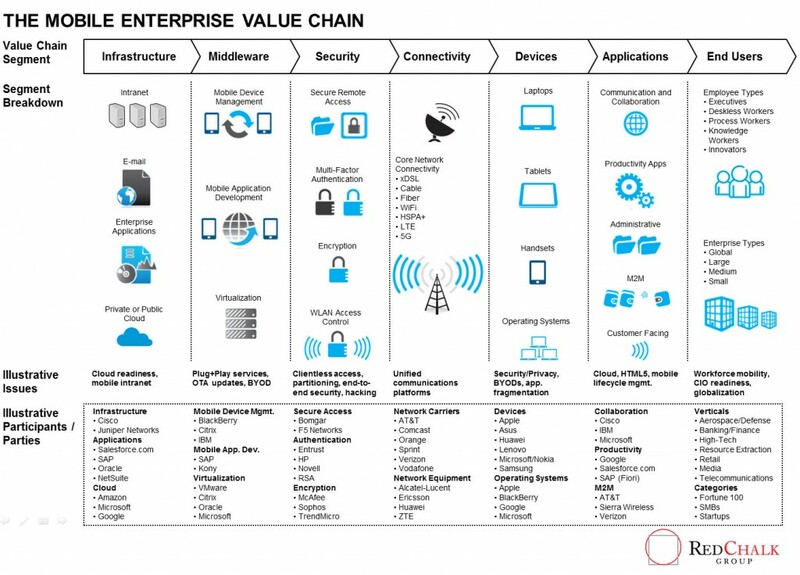 The mobile enterprise value chain has evolved in the past decade and now includes a variegated set of segment focused players – notably, the recurrence of leading IT players such as Cisco, IBM, and SAP. See Exhibit 1. We highlight strategic implications for key market participants across the value chain as catalyzed by the continued evolution and uptake of each use case. See Exhibit 2. Looking forward, the emergence of compelling, cloud-based collaboration platforms, QoS differentiation, incremental digital channels to engage customers/ stakeholders, and the evolution of tailored Big Data analytics collectively imply vertical integration moves, likely through M&A, in addition to new alliances / partnerships and JV models. These strategic moves are expected as vendors develop to better serve an end-user segment that is fragmented across dimensions critical to unique enterprise clusters, including but not limited to: security, customer engagement, B2B/B2C models, and operational breadth.